The Bureau of Labor Statistics (BLS) estimates that the average weekly salary of someone without a college degree is about $750 while the average weekly salary of someone with a bachelor’s degree is $1,173. In some industries, a bachelor’s degree is required even for entry level positions. If a college education is necessary for your long-term career goals, including licensing requirements, you should take steps now to become a qualified applicant. There are several key factors to consider when comparing online programs, including cost, program length, accreditation status, and graduation rates. Pursuing higher education is a long-term investment, so you want to make sure that the program you select offers a return on that investment and helps you achieve your career goals. Our ranking of online colleges considers these key factors, helping you choose the program that is right for you. What Are the Cheapest Online Colleges for Bachelor’s Degrees? What Are the Best Online Degrees to Pursue? What Are The Top-Paying Bachelor’s Degrees? This list ranks schools in order of their average net price for the most recent academic year. This information, sourced from the National Center for Education Statistics, reflects the average price paid by students for the school year after factoring in tuition cost, required fees, books and supplies, and financial aid. To be included on this list, schools must also offer a minimum of five distinct online bachelor’s degree programs. The numbers below reflect the average net price for one full academic year. Indian River State College ranks #1 on The 50 Most Affordable Online Four-Year Colleges! Indian River State College enrolls over 18,000 students in undergraduate degree and non-degree programs, both on campus and online. A public, state college based in Fort Pierce, Florida, Indian River State College serves students locally and abroad who seek affordable undergraduate education options. Indian River State College is accredited by the Southern Association of Colleges and Schools Commission on Colleges (SACSCOC). Texas A&M University–Central Texas ranks #2 on The 50 Most Affordable Online Four-Year Colleges! Texas A&M University–Central Texas, a public university, enrolls nearly 2,000 undergraduate students in variety of programs. Founded in 1999, the university became part of the Texas A&M University system in 2009. Texas A&M University–Central Texas is accredited by the Southern Association of Colleges and Schools Commission on Colleges (SACSCOC). Fayetteville State University ranks #3 on The 50 Most Affordable Online Four-Year Colleges! Fayetteville State University, a public university established in 1867, enrolls over 5,500 undergraduate students in a variety of degree and non-degree programs, with a wide selection of online program options. A historically black university, Fayetteville State University operates as part of the University of North Carolina System and the Thurgood Marshall College Fund. Fayetteville State University is accredited by the Southern Association of Colleges and Schools Commission on Colleges (SACSCOC). Bellevue University ranks #4 on The 50 Most Affordable Online Four-Year Colleges! Bellevue University, a private non-sectarian university with over 5,500 undergraduates enrolled, maintains a dedication to serving the educational needs of busy, working adults who seek professional advancement. With 49 online bachelor’s degree programs, Bellevue University offers a comprehensive selection of online options for study. University of Houston-Downtown ranks #5 on The 50 Most Affordable Online Four-Year Colleges! The University of Houston-Downtown, a public four-year university, enrolls nearly 13,000 undergraduate students in a variety of degree and non-degree programs, with a healthy selection of online options. Founded in 1974, the University of Houston-Downtown holds the title of being the second-largest university in the Houston area. The University of Houston-Downtown is accredited by the Southern Association of Colleges and Schools Commission on Colleges (SACSCOC). St. Petersburg College ranks #6 on The 50 Most Affordable Online Four-Year Colleges! With over 30,000 undergraduate students enrolled, St. Petersburg College serves a large student population through a wide variety of on-campus and online program options. Founded in 1927 as a private two-year college, St. Petersburg College has since grown into a public, full-scale university, as part of the Florida College System. Amridge University ranks #7 on The 50 Most Affordable Online Four-Year Colleges! Amridge University, a private university affiliated with the Churches of Christ, enrolls a tight-knit community of 300 undergraduates in a variety of four-year programs. Initially serving as a seminary, Amridge University has since grown to include other areas of study. Amridge University is accredited by the Southern Association of Colleges and Schools Commission on Colleges (SACSCOC). Louisiana State University - Alexandria ranks #8 on The 50 Most Affordable Online Four-Year Colleges! Founded in 1960, the public Louisiana State University–Alexandria enrolls over 3,000 undergraduate students in a variety of two-year and four-year programs. Part of the LSU system, the University serves local and out-of state students with a diverse selection of online programs. Louisiana State University-Alexandria is accredited by the Southern Association of Colleges and Schools Commission on Colleges (SACSCOC). Peirce College ranks #9 on The 50 Most Affordable Online Four-Year Colleges! Peirce College, private, non-sectarian college founded in 1865, enrolls around 1,500 undergraduate students in a variety of two-year and four-year programs. Initially founded as a business school, Peirce College remains committed to the goal of professional preparation for career-minded students, and provides plenty of online program options. Brigham Young University-Idaho ranks #10 on The 50 Most Affordable Online Four-Year Colleges! Founded in 1888, Brigham Young University-Idaho enrolls a huge undergraduate student population, around 45,000, in a wide variety of two-year and four-year, degree and non-degree, and on-campus and online programs. Part of the Brigham Young University system, BYU-Idaho is a private university affiliated with the Church of Jesus Christ of Latter-day Saints. Brigham Young University-Idaho is accredited by the Northwest Commission on Colleges and Universities (NWCCU). Indiana University-East ranks #11 on The 50 Most Affordable Online Four-Year Colleges! Indiana University-East, a public university founded in 1971, enrolls over 4,000 undergraduate students in a variety of two-year and four-year programs. Part of the Indiana University system, Indiana University-East seeks to make education accessible to all through a substantial selection of online program options. Indiana University-East is accredited by the Higher Learning Commission (HLC). University of Maine at Augusta ranks #12 on The 50 Most Affordable Online Four-Year Colleges! Founded in 1965, the public University of Maine at Augusta enrolls around 4,500 undergraduate students in a variety of two-year and four-year programs. A healthy selection of online program options serves non-traditional students. University of Alaska-Southeast ranks #13 on The 50 Most Affordable Online Four-Year Colleges! The University of Alaska-Southeast, a public university founded in 1987, enrolls over 2,000 undergraduate students in a variety of two-year and four-year degree and non-degree programs. With several campuses, as well as online options, the University of Alaska-Southeast serves traditional and non-traditional students alike. The University of Alaska-Southeast is accredited by the Northwest Commission on Colleges and Universities (NWCCU). University of Missouri-St. Louis ranks #14 on The 50 Most Affordable Online Four-Year Colleges! The University of Missouri-St. Louis, a public university established in 1963, enrolls around 14,000 undergraduate students in a variety of two-year and four-year programs. Part of the University of Missouri System, the University of Missouri-St. Louis provides plenty of online, evening, and hybrid program options for non-traditional students. The University of Missouri-St Louis is accredited by the Higher Learning Commission (HLC). Texas Woman’s University ranks #15 on The 50 Most Affordable Online Four-Year Colleges! Texas Woman’s University, a public university founded in 1901, enrolls over 10,000 undergraduate students in a variety of two-year and four-year programs. Initially founded as a women’s college, Texas Woman’s University has since grown into a co-educational institution. 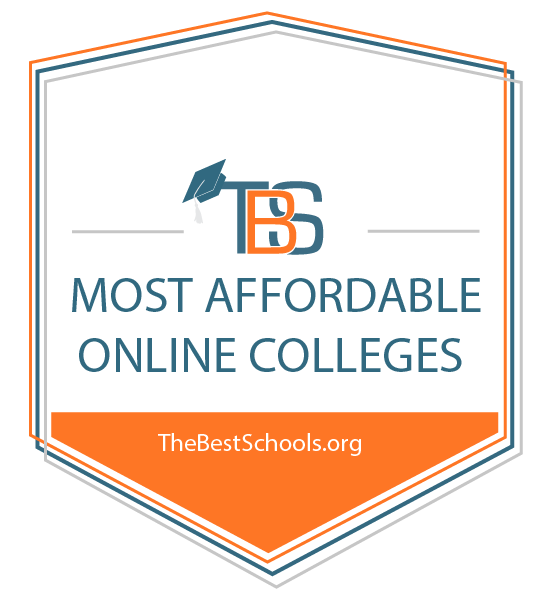 Texas A&M University–Commerce ranks #16 on The 50 Most Affordable Online Four-Year Colleges! Part of the public Texas A&M University system, Texas A&M University–Commerce enrolls over 8,000 undergraduate students in two-year and four-year programs. Founded in 1889, Texas A&M University–Commerce serves traditional and non-traditional students seeking professional advancement through residential and online program options. Texas A&M University–Commerce is accredited by the Southern Association of Colleges and Schools Commission on Colleges (SACSCOC). Cameron University ranks #17 on The 50 Most Affordable Online Four-Year Colleges! Cameron University, a public university founded in 1908, enrolls around 4,500 undergraduate students in a wide variety of two-year and four-year programs. With a substantial selection of online degree programs, Cameron University serves non-traditional students in pursuit of professional success through higher education. Cameron University is accredited by the Higher Learning Commission (HLC). University of Alaska-Fairbanks ranks #18 on The 50 Most Affordable Online Four-Year Colleges! The University of Alaska-Fairbanks, a public university founded in 1917, enrolls over 7,000 undergraduate students in two-year and four-year programs. The flagship institution of the University of Alaska system, the University of Alaska-Fairbanks houses several major research units. The University of Alaska-Fairbanks is accredited by the Northwest Commission on Colleges and Universities (NWCCU). The University of Texas of the Permian Basin ranks #19 on The 50 Most Affordable Online Four-Year Colleges! The University of Texas of the Permian Basin, a public university founded in 1973, enrolls nearly 6,000 undergraduate students in a variety of two-year and four-year programs. With a healthy selection of online degree programs, the University of Texas of the Permian Basin meets the needs of non-traditional students seeking to enter or advance in diverse fields. The University of Texas of the Permian Basin is accredited by the Southern Association of Colleges and Schools Commission on Colleges (SACSCOC). Western Governors University ranks #20 on The 50 Most Affordable Online Four-Year Colleges! Western Governors University, a public university founded in 1996, enrolls a massive undergraduate population of nearly 65,000 students. A completely online university, Western Governors University dedicates its programs to meeting the unique needs of non-traditional students, with 28 online bachelor’s degree programs offered through four distinct colleges. University of Louisiana at Monroe ranks #21 on The 50 Most Affordable Online Four-Year Colleges! The University of Louisiana at Monroe, a public university founded in 1931, enrolls nearly 8,000 undergraduate students in a variety of two-year and four-year programs. With a large selection of online program options, the University of Louisiana at Monroe serves traditional and non-traditional students alike. The University of Louisiana at Monroe is accredited by the Southern Association of Colleges and Schools Commission on Colleges (SACSCOC). Missouri Southern State University ranks #22 on The 50 Most Affordable Online Four-Year Colleges! Missouri Southern State University, a public university founded in 1937, enrolls over 6,000 undergraduate students in a variety of two-year and four-year programs. Initially established as Joplin Junior College, the institution has grown significantly over its lifespan, becoming a four-year college in 1968. Missouri Southern State University is accredited by the Higher Learning Commission (HLC). Weber State University ranks #23 on The 50 Most Affordable Online Four-Year Colleges! Weber State University, a public university established in 1889, enrolls a large student population of over 26,000 undergraduates in a wide variety of programs. Founded by the Church of Jesus Christ of Latter-Day Saints with initial enrollment of 98 students, Weber State University has since grown significantly, and now operates as a public non-sectarian university. Weber State University is accredited by the Northwest Commission on Colleges and Universities (NWCCU). McNeese State University ranks #24 on The 50 Most Affordable Online Four-Year Colleges! McNeese State University, a public university founded in 1939, enrolls nearly 7,000 undergraduate students in a variety of two-year and four-year programs. Originally established as a division of Louisiana State University and called Lake Charles Junior College, McNeese State University has since become an autonomous institution, offering a full-range of programs. McNeese State University is accredited by the Southern Association of Colleges and Schools Commission on Colleges (SACSCOC). Minot State University ranks #25 on The 50 Most Affordable Online Four-Year Colleges! Established in 1913, the public Minot State University enrolls over 3,000 undergraduate students in a variety of two-year and four-year programs. Initially founded as the Minot Normal School for teacher preparation, the institution has since grown into a full university. Minot State University is accredited by the Higher Learning Commission (HLC). Appalachian State University ranks among The 50 Most Affordable Online Four-Year Colleges! Appalachian State University, a public university founded in 1899, enrolls over 16,000 undergraduate students in a variety of two-year, four-year, and non-degree programs. Initially founded as a Normal School for teacher preparation, Appalachian State University became part of the University of North Carolina System in 1971. Appalachian State University is accredited by the Southern Association of Colleges and Schools Commission on Colleges (SACSCOC). Nicholls State University ranks among The 50 Most Affordable Online Four-Year Colleges! Nicholls State University, a public university founded in 1948, enrolls over 5,000 undergraduate students in a variety of two-year, four-year, and non-degree programs. Initially founded as the Francis T. Nicholls Junior College of Louisiana State University, Nicholls State University has since expanded its academic offerings while shortening its name. Nicholls State University is accredited by the Southern Association of Colleges and Schools Commission on Colleges (SACSCOC). Troy University ranks among The 50 Most Affordable Online Four-Year Colleges! Troy University, a public university founded in 1887, enrolls over 14,000 undergraduate students in a wide variety of two-year and four-year programs. Initially founded as the Troy State Normal School, the institution has since grown to offer a full range of degree and non-degree programs, including more than 20 online bachelor’s degree programs. Clayton State University ranks among The 50 Most Affordable Online Four-Year Colleges! Clayton State University, a public university founded in 1969, enrolls nearly 7,000 students in a variety of two-year, four-year, and non-degree programs. Initially established as a Junior College, Clayton State University became a four-year institution in 1986. Clayton State University is accredited by the Southern Association of Colleges and Schools Commission on Colleges (SACSCOC). State College of Florida Manatee-Sarasota ranks among The 50 Most Affordable Online Four-Year Colleges! The State College of Florida Manatee-Sarasota, a public institution founded in 1957, enrolls over 10,000 undergraduate students in a variety of two-year and four-year programs. Initially established as the Manatee Junior College, the institution changed its name and began offering bachelor’s degrees in 2009. The State College of Florida Manatee-Sarasota is accredited by the Southern Association of Colleges and Schools Commission on Colleges (SACSCOC). University of North Carolina at Greensboro ranks among The 50 Most Affordable Online Four-Year Colleges! The University of North Carolina at Greensboro, a public university founded in 1891, enrolls over 16,000 undergraduates in a variety of two-year, four-year, and non-degree programs. Initially established as a women’s college, the University has since undergone significant growth. The University of North Carolina at Greensboro is accredited by the Southern Association of Colleges and Schools Commission on Colleges (SACSCOC). University of North Alabama ranks among The 50 Most Affordable Online Four-Year Colleges! The University of North Alabama enrolls over 6,000 undergraduate students in a variety of two-year, four-year, and non-degree programs. The oldest four-year public university in the state, the University of North Alabama was initially established as LaGrange College in 1830. Eastern New Mexico University-Main Campus ranks among The 50 Most Affordable Online Four-Year Colleges! Eastern New Mexico University, a public institution, enrolls over 4,500 undergraduate students in a variety of two-year, four-year, and non-degree programs. Initially founded in 1927 as a state Normal School, the school was not opened until 1934 due to complications that arose from the Great Depression. Eastern New Mexico University-Main Campus is accredited by the Higher Learning Commission (HLC). Murray State University ranks among The 50 Most Affordable Online Four-Year Colleges! Murray State University, a public university founded in 1922, enrolls nearly 9,000 undergraduate students in a variety of two-year, four-year, and non-degree programs. Initially created as a Normal School for teacher preparation, the institution began offering bachelor’s degrees in 1926, and was first accredited by SACSCOC in 1928. Murray State University is accredited by the Southern Association of Colleges and Schools Commission on Colleges (SACSCOC). Western New Mexico University ranks among The 50 Most Affordable Online Four-Year Colleges! Western New Mexico University, a public university founded in 1893, enrolls around 2,500 undergraduate students in a variety of two-year, four-year, and non-degree programs. Initially established as the New Mexico Normal School and offering classes in a rented Presbyterian Church, the institution has since grown significantly. Western New Mexico University is accredited by the Higher Learning Commission (HLC). Tarleton State University ranks among The 50 Most Affordable Online Four-Year Colleges! Founded in 1899, the public Tarleton State University enrolls nearly 12,000 undergraduate students in a wide array of two-year, four-year, and non-degree programs with a professional focus. Tarleton State University became part of the Texas A&M University system in 1917, and became a four-year degree-granting institution in 1959. Indiana State University ranks among The 50 Most Affordable Online Four-Year Colleges! Indiana State University, a public university founded in 1865, enrolls more than 11,000 undergraduate students in over 100 different programs. Initially established as the Indiana State Normal School for teacher preparation, the institution awarded its first four-year degree in 1908, and first Master’s degree in 1928. Indiana State University is accredited by the Higher Learning Commission (HLC). California State University-East Bay ranks among The 50 Most Affordable Online Four-Year Colleges! California State University-East Bay, a public university founded in 1957, enrolls over 13,000 undergraduate students in over 50 fields of study in two-year, four-year, and non-degree programs. With several campuses in its area, as well as online programs options, California State University-East Bay serves traditional and non-traditional students alike. California State University-East Bay is accredited by the WASC Senior College and University Commission (WSCUC). North Carolina Central University ranks among The 50 Most Affordable Online Four-Year Colleges! North Carolina Central University, a public university founded in 1910, enrolls over 6,000 undergraduate students in a variety two-year, four-year, and non-degree programs. A historically black university initially established for teacher training, the institution has since grown significantly, offering a full range of degree programs, and maintaining an African-American student population of around 80 percent. North Carolina Central University is accredited by the Southern Association of Colleges and Schools Commission on Colleges (SACSCOC). Arkansas Tech University ranks among The 50 Most Affordable Online Four-Year Colleges! Arkansas Tech University, a public university founded in 1909, enrolls over 11,000 undergraduate students in a variety of two-year, four-year, and non-degree programs. Initially founded as the Second District Agricultural School, the institution took its current name in 1976, and enrolled its first doctoral cohort in 2015. Arkansas Tech University is accredited by the Higher Learning Commission (HLC). University of Houston-Victoria ranks among The 50 Most Affordable Online Four-Year Colleges! The University of Houston-Victoria, a public university founded in 1973, enrolls over 3,000 undergraduate students in a variety of two-year, four-year, and non-degree programs. Initially established as a community college, the institution became part of the University of Houston system in 1983. The University of Houston-Victoria is accredited by the Southern Association of Colleges and Schools Commission on Colleges (SACSCOC). University of West Florida ranks among The 50 Most Affordable Online Four-Year Colleges! The University of West Florida, a public university founded in 1963, enrolls over 10,000 undergraduate students in in a variety of two-year, four-year, and non-degree programs. A research university and designated space-grant institution, the University of West Florida formed from the space race push of the 1960s. University of Nebraska at Omaha ranks among The 50 Most Affordable Online Four-Year Colleges! The University of Nebraska at Omaha, a public research university founded in 1908, enrolls more than 12,000 undergraduate students in a wide variety of two-year, four-year, and non-degree programs. Originally opened as the private Omaha University, the institution became public in 1930, and became part of the University of Nebraska system in 1968. The University of Nebraska at Omaha is accredited by the Higher Learning Commission (HLC). Central Methodist University ranks among The 50 Most Affordable Online Four-Year Colleges! Central Methodist University, a private university affiliated with the United Methodist Church, enrolls around 4,000 undergraduate students, many of them online, in a wide variety of two-year, four-year, and non-degree programs. Founded in 1853, the institution has grown significantly over its history. Central Methodist University is accredited by the Higher Learning Commission (HLC). Dickinson State University ranks among The 50 Most Affordable Online Four-Year Colleges! Dickinson State University, a public university founded in 1918, enrolls a tight-knit community of over 1,000 undergraduate students in a wide variety of programs. Initially established as a Normal School, the institution has since grown to full four-year university status. Dickinson State University is accredited by the Higher Learning Commission (HLC). Florida Atlantic University ranks among The 50 Most Affordable Online Four-Year Colleges! Florida Atlantic University, a public university founded in 1961, enrolls a large undergraduate student population of over 25,000 in a wide variety of programs. The first public university in southeast Florida, Florida Atlantic University has since grown in multitudes from its initial total enrollment of 867 students. Florida Atlantic University is accredited by the Southern Association of Colleges and Schools Commission on Colleges (SACSCOC). Western Kentucky University ranks among The 50 Most Affordable Online Four-Year Colleges! Western Kentucky University, a public university founded in 1906, enrolls over 18,000 undergraduate students in a wide variety of programs. Initially established as a Normal School, Western Kentucky University began granting four-year degrees in 1922. Western Kentucky University is accredited by the Southern Association of Colleges and Schools Commission on Colleges (SACSCOC). University of Illinois at Springfield ranks among The 50 Most Affordable Online Four-Year Colleges! The University of Illinois at Springfield, a public university founded in 1969, enrolls more than 3,000 undergraduate students in a variety of two-year, four-year, and non-degree programs. Originally opened as Sangamon State University, an upper-division university, the institution became a four-year university in 2001. The University of Illinois at Springfield is accredited by the Higher Learning Commission (HLC). Northwestern State University of Louisiana ranks among The 50 Most Affordable Online Four-Year Colleges! Northwestern State University of Louisiana, a public university founded in 1884, enrolls nearly 9,000 undergraduate students in a variety of two-year, four-year, and non-degree programs. Through its eNSU Global Campus the university offers plenty of online program options for students at all levels. Northwestern State University of Louisiana is accredited by the Southern Association of Colleges and Schools Commission on Colleges (SACSCOC). Columbus State University ranks among The 50 Most Affordable Online Four-Year Colleges! Columbus State University, a public university founded in 1958, enrolls nearly 7,000 undergraduate students in a variety of two-year, four-year, and non-degree programs. Initially a Junior College, Columbus State University became approved to offer four-year degree programs in 1965. Columbus State University is accredited by the Southern Association of Colleges and Schools Commission on Colleges (SACSCOC). As the chart below indicates, there is a higher demand for workers with a bachelor’s degree, and employers are willing to pay them a higher salary. Pursuing a four-year bachelor’s degree also allows candidates to specialize their skills by earning a minor, giving them a competitive advantage in some job markets. A bachelor’s degree has become increasingly necessary in many professions, and earning one will set you up for better professional opportunities than a diploma or associate degree. In order to gain accreditation, schools must be evaluated against minimum standards of quality by a third party agency. Once accredited, schools undergo periodic review from accreditation agencies to ensure they maintain those standards. In turn, the Department of Education (ED) and the Council for Higher Education Accreditation (CHEA) oversee all accrediting agencies. ED and CHEA also maintain public, searchable databases of all approved agencies and accredited schools. The two main types of accreditation are regional and national, but there is also a sub-type known as programmatic accreditation. Regional accreditation applies to schools within a specific geographical area, and those schools tend to be degree-granting liberal arts institutions. For this reason, regional accreditation is generally seen as more prestigious. A few main regional accreditation agencies are the Middle States Commission on Higher Education, the Higher Learning Commission, and the New England Commission on Higher Education. National accreditation can apply to any school in the U.S. and usually covers vocational or religious schools, while programmatic accreditation means a program has been reviewed by a professional association and meets minimum standards of quality for that particular industry. Programmatic accreditation is not typically required, though there are some professions where it is, so do your research thoroughly. Our rankings only include regionally accredited online colleges. In some cases, online degrees are cheaper than traditional degrees, though they usually cost the same; however, online students can often complete programs at an accelerated pace, which can mean lower costs than a traditional degree path. Students considering online programs should utilize the same money-saving tactics as traditional students, especially when it comes to in-state or out-of-state tuition rates. Even though online colleges are usually accessible from anywhere in the world, in-state and out-of-state tuition fees can still apply. Students should seriously consider the advantages of in-state tuition discounts. Not only do they make an online degree more affordable, but finding an online college in your state means more local networking opportunities, and local employers are sure to recognize your alma mater. Like traditional programs, the average online bachelor’s degree program requires 120 credits and takes four years to complete. Tuition rates vary but generally range from $200-$500 per credit. Factors that impact cost include the number of required credits and whether there is an accelerated option that allows you to graduate faster. Choosing a private versus a public school can also affect your costs as private schools tend to be more expensive than public schools. You should also look at program transfer credit policies; you may be able to complete prerequisites at a more affordable institution, like a community college, and then transfer to a more expensive program for your major requirements, thereby reducing your overall costs. While affordability is important, seeking out the cheapest online colleges can sometimes result in an inferior education. Instead, you should balance cost with school quality. You may end up spending more money for a higher-quality online college, but any money spent on a bad program is money wasted, which is why our lists consider quality as well as cost. Before enrolling, consider the reputation of your school, the learning format and environment, accreditation and other accolades, and whether the school meets your professional goals. Online colleges allow you to study from anywhere, regardless of the school’s location, but location matters when it comes to tuition. Online colleges and universities in your state of residence will probably be more affordable because many schools raise the price of tuition -- sometimes doubling it -- for out-of-state students, even if they’re studying 100% online. However, other schools offer in-state tuition for all online students, so look into each online program you are considering. The universities and colleges ranked here offer the most affordable regionally accredited online degree programs in the United States. If one of these online schools is in your state, then you might have found your match, but you should also check out other top-ranked online colleges in your state. The price difference between the most affordable online college and the best online college in your state may not be much. As mentioned previously, one key to selecting the most affordable college is to stay in state if possible. To see more colleges in your home state, browse our ranking of the Best Online Colleges by State. The best online degrees are those offered by affordable schools that help students further their education and accomplish goals. That said, some online degrees are better regarded by graduate schools and employers than others. Elsewhere on this site, we highlighted the 25 Best Online Degrees, which tend to fall into one of five categories: business; computers and information technology, healthcare; science and engineering; and social science and criminal justice. Many schools offer online programs in all of these areas. Pursuing a bachelor’s degree is a long-term investment that pays out in career prospects and earning potential. To protect your investment, you should select a program that employers respect. A bachelor’s degree qualifies you for a variety of lucrative career paths, five of which are listed in the table below. These jobs all require a bachelor’s degree for entry-level positions. Online programs are growing in popularity because they are convenient and sometimes more affordable than traditional programs, but cost isn’t the only factor to consider. There are a variety of other considerations, like those listed below. To ensure you find the best fit, you should take your time researching as many online bachelor’s programs in your desired field as possible before making a choice. Transfer Policies: Transferring eligible college credits can save you time and money. Transfer credits are especially important for online students because many online programs charge per credit rather than per term. Minimizing the number of credits you need to graduate means reduced tuition costs. School Size and Type: The size of the school and whether it is private or public could affect both cost and degree offerings. In general, public schools are bigger, more affordable, and offer a larger variety of degrees. Private school tends to be smaller, pricier, and more specialized. Program Delivery: Programs can be delivered on campus, online, or through a combination of the two. Online programs can be synchronous, meaning you must log in to your virtual classroom at a designated time, or asynchronous, meaning you receive coursework and a deadline and must work on your own schedule. Asynchronous courses are more flexible, but require more self-discipline. It’s important to consider which style is a better fit for your personality. On-Campus Requirements: An on-campus requirement could include lab work or proctored exams. This is an important factor for online students to consider because they may not be able to travel to a school’s campus, which could mean they can’t complete the program. If a program’s on-campus requirements are unclear, you should contact a program advisor for clarification. Program Reputation: A program’s reputation can be measured through accreditation status or student graduation and employment rates. An accredited school or program meets minimum quality standards, giving you a competitive advantage in the job market over schools that don’t meet those standards. Additionally, a school with high post-graduation employment rates likely has a good reputation among employers. There are a variety of ways to finance your education. The first thing a prospective students should do is fill out a FAFSA form to determine federal financial aid qualifications. Students should also research loans, scholarships, and work study opportunities, making sure to compare interest rates and payment plans. Below are a few scholarship options to get you started. Who Can Apply: This scholarship is open to any student enrolled in an accredited online program. Students must write an essay about what an online degree means to them and submit their most recent FAFSA form and grade transcript. There are two submission periods each year. Students must be U.S. citizens and have a minimum GPA of 3.0.
Who Can Apply: This scholarship is open to 10th-12th grade and undergraduate students planning to attend or already attending an accredited university or trade school. In 250 words or less, students must explain how they will use their educations to better lives or communities. Who Can Apply: The Unigo $10k Scholarship is available to students over the age of 13 and currently enrolled in an accredited college, university, or trade school. To apply, students must answer, in 250 words or less, this question: Imagine a historical figure is brought back to life. Who is it? What’s their favorite mobile app? Who Can Apply: This scholarship is open to graduating high school seniors with a minimum GPA of 3.0. Students must submit a 500-word response to the application prompt along with transcripts, a resume detailing any academic honors, community service, or extracurricular activities, a completed financial aid form, a headshot, and a letter of recommendation. Who Can Apply: Available to students 13-25 years old, Do Something’s Easy Opportunity Scholarships have no minimum GPAs, essay requirements, or applications. Insteads, students can enroll in the monthly drawings by participating in community service campaigns. Each campaign offers its own scholarship amount, and students can enroll in as many campaigns as they wish.